Introduction: The Rufescent Screech Owl is relatively large for a screech Owl and has small ear-tufts. Typical call (A-song) - Septimo Paraiso Lodge, Mindo, Ecuador. © Bruce Marcot. Description: The indistinct facial disc is buffish-brown, and slightly marked with darker concentric lines around the eyes, which are honey-brown. Cere and bill are olive-yellow. The ear tufts are short, and the crown indistinctly scalloped buffish and dark. The upperparts are rather dark olive-tawny, rufous or grey-brown, with fine dark vermiculations and some fine whitish spots. Scapulars have buffish-white edges, forming an indistinct pale band across the shoulder. The flight feathers are barred cinnamon and dusky, while the tail has cinnamon and darker brown bars. The underparts are paler than the upperparts, with a few thin shaft-steaks and fine dark and buffish-white vermiculations. Tarsi are densely feathered to the base of the yellowish-grey toes. Claws are pale horn with darker tips. Size: Length 25-28cm. Wing length 184-208mm. Tail length 94-113mm. Weight 134-223g. Females are heavier than males. Habits: The Rufescent Screech Owl is a strictly nocturnal bird, becoming active at dusk. It roosts during the day among epiphytes (non-parasitic plants that grow in trees) on thick branches, often close to the trunk. Voice: The A-song is a phrase of about 50 equally spaced ut notes in rather rapid succession, lasting about 10 seconds or longer - utututututututut. This sequence begins softly and increases gradually in volume, and sometimes falls in pitch. The B-song is apparently a series of evenly pitched notes, accelerating suddenly after about the fourth note, but with a slightly longer interval before the final note (like a bouncing ball) - bu bu bu bu bububububu-bu. 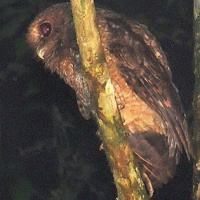 Hunting & Food: This owl feeds on larger insects and spiders, as well as small vertebrates. 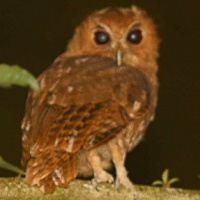 Breeding: Little is known about the breeding biology of the Rufescent Screech Owl. They most likely nest in natural holes in trees. Habitat: Humid forest on mountain slopes with plenty of epiphytes. Ranges from about 1200 to 2500m above sea level. 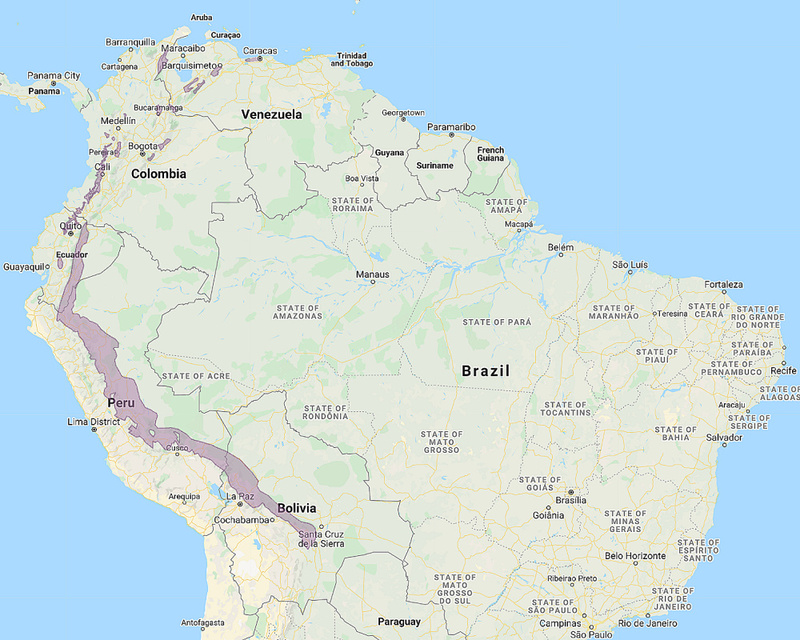 Distribution: Eastern slopes of the Andes locally from Venezuela to Ecuador, Peru and northern Bolivia. Original Description: Salvin, Osbert. 1897. Bulletin of the British Ornithologists' Club (BBOC), 6, p. 37. 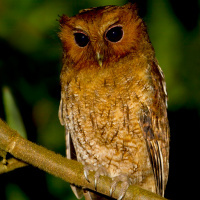 See also: Other owls from South America, Genus: Megascops. Page by Deane Lewis. Last updated 2015-10-12.